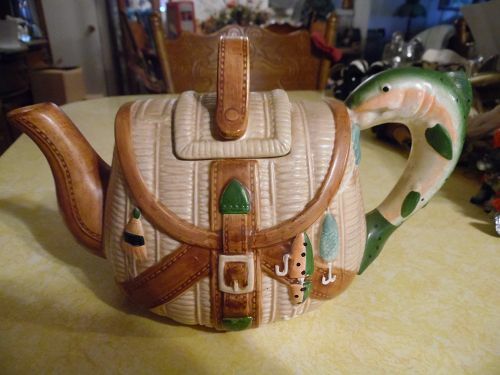 Adorable hand painted ceramic fishing creel teapot with trout handle. Measures 6" tall and is 10" from spout to handle. Perfect condition and has safety catch on the lid. Perfect for your cabin decor. 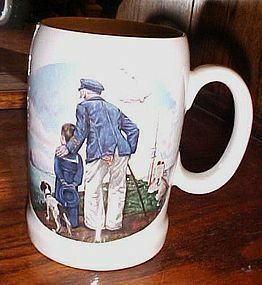 VTG 1980 Norman Rockwell Looking Out to Sea Collector's Stein Sailor Boat Ship. Very heavy. 3 1/2" diameter, 5 1/2" tall. Great pre-owned condition with the usual estate wear. No chips, no cracks, no crazing. 5th issue in the Norman Rockwell collection of Legendary Art. 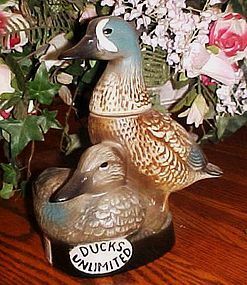 EMPTY Jim Beam Whiskey decanter with Ducks Unlimited waterfowls. 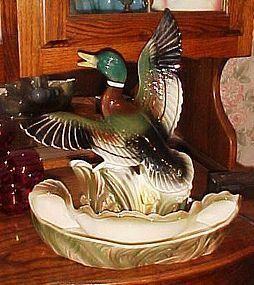 The decanter measures 9 1/2" tall on the largest duck. Features 2 ducks with largest ducks head removable for the stopper.This head screws on instead of the traditional stopper they normally used. Great collector piece with no chips or cracks, excellent condition. Original seals. 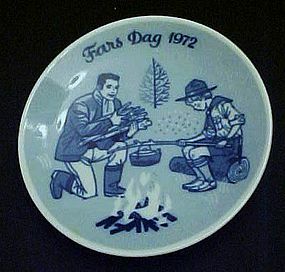 Limited Edition Fathers Day plate for 1972 by Porsgrunds Norway. Artist Gunnar Bratlie. Pretty cobalt blue delft coloring featuring a boy and his Dad camping, and warming by the campfire. Plate measures 5 1/8" diameter and is in excellent condition with no damages or repairs. Second issue in the series. Plate only, no box. I will be listing several of these in different years, and aso the Mothers Day (Mos Dag) ones. Check out the catalog. 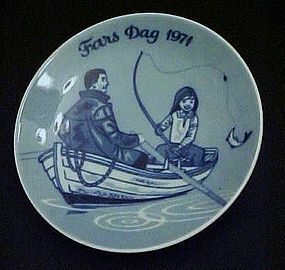 Limited Edition Fathers Day plate for 1971 by Porsgrunds Norway. Artist Gunnar Bratlie. 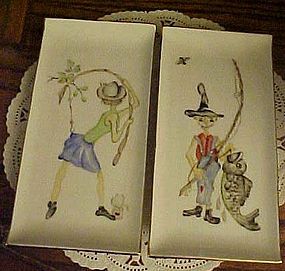 Pretty cobalt blue delft coloring featuring a girl fishing with her dad in a boat. Plate measures 5 1/8" diameter and is in excellent condition with no damages or repairs. First issue in the series. Plate only, no box. I will be listing several of these in different years, and aso the Mothers Day (Mos Dag) ones. Check out the catalog. Nice old advertising premium from The Army Navy Store Redding, Anderson, Red Bluff (California). Gold metal framed. 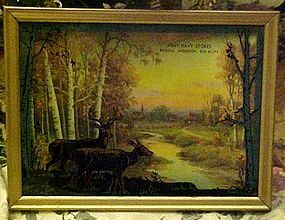 Reverse painted silhouette style of trees and deer on glass. Curved cardboard back scenery gives it a dimensional look. Measures 6" x 8". Extra nice condition. All original backing, and has a hang tab. 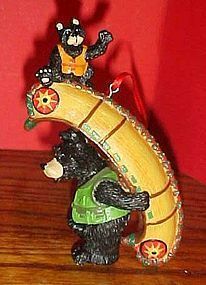 An ornament for the sportsman. This is made of resin and is hand painted. Moose in his fishing waders has a pole witha fish on it, his creel strapped on and a net in the other hand. Measures 4 1/4" tall and is in excellent condition. 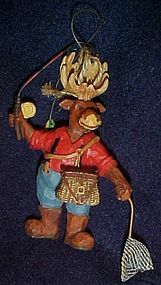 An ornament for the sportsman. This is made of resin and wire and is hand painted. 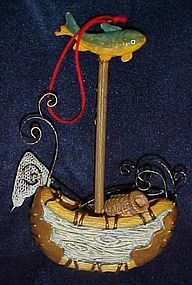 Birch bark canoe with basket and net inside, and a fish on top of the mast. 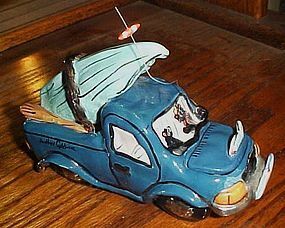 Measures 5 1/2" tall and is in excellent condition. 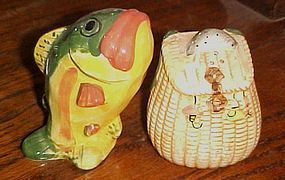 Larger Avon Fishing Stein. Has nice pewter lid with a fish on top of same ceramic. 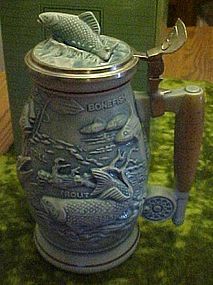 Various species of fish are embosssed all around the sides of the stein. pristine condition with no chips or cracks.Was removed from the box briefly to look at. 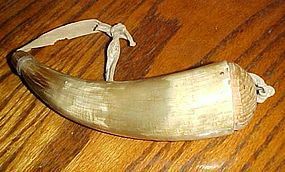 Measures 8 inches tall and over 6 inches wide including the handle. 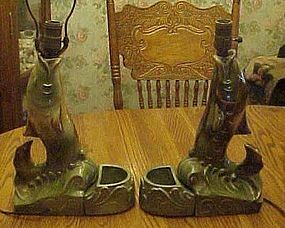 The bottom reads in part "Fishing Stein Avon Products 1990." The bottom also has the year 1990 and is numbered. Comes in the original box & packaging.